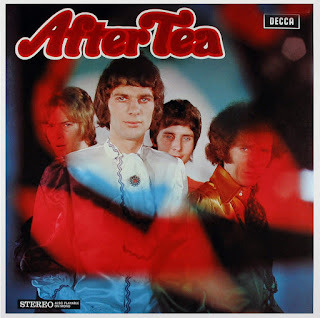 After Tea from the picturesque town of Delft were formed in 1967 after a row in the group The Tee Set whose singer Peter Tetteroo had problems with the psychedelic leanings of his"backing group". 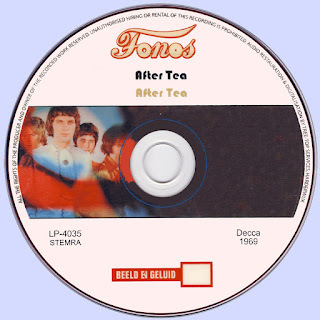 Tetteroo chose the James Mean musicians as his new colleagues and the rest of the Tee Set became After Tea.The line up this time was Hans van Eyck (vocals, keyboards), Polle Eduard (vocals, bass, guitar), Martin Hage (drums) and the Englishman Ray Fenwick (vocals, guitar). All members were composers, expert musicians and good vocalists and soon became well respected and were quickly signed to Decca. Together with producer Bert Schouten they worked hard on their first single, the first Dutch "flower power" record "Not Just a Flower in Your Hair" (complete with children's choir). On the b-side was "The Time is Nigh", with the same choir as a gimmick together with the Sousa march "Stars and Stripes Forever" at the end. The Beatles ended "All You Need is Love" in a similar way later on. The single was played a lot on radio and reached 11 in the Top 40. In the studio new numbers were tried out for the new album. The old Tee Set song "Long Ago" was redone in a new "easy" style and "Don't Waste Your Love On Me" was written with lyrics by Hitweek's magazine's Laurie Langenbach. In December 1967 the album "National Disaster" came out. The LP is packaged in a "Wanted Dead or Alive" sleeve and includes a large poster inside. The music is a mix of flower power ideology and fragile numbers such as "Gotta Get You In My Garden Girl" and "In The Land Of The Bubble Gum Tree" and more progressive songs like "Play That Record" , the new version of "Long Ago" and Ray Fenwick's title number "National Disaster". The album got a good public response and glowing reviews in Hitweek, Musiek Express and Teenbeat. The LP was released in the UK in June 1968 and received good reviews in NME and Melody Maker. In England Steve Winwood from the Spencer Davis Group was forming his own group, Traffic. Davis was looking for a replacement and when After Tea and Spencer Davis played together in Rotterdam, he asked Ray Fenwick if he would like to join his band as a replacement for Winwood. Ray had some doubts , but because his work permit as a musician had only months left to run and the possibility of him being asked to leave the country he accepted and left for England. He continued to write some songs for After Tea and played now and then on a few records. "We Will Be There After Tea" written by Hans and Ray became another hit in December 1967. The song with it's catchy lyrics was underpinned by a strong melody and later became a regular favourite for The Spencer Davis Group with Ray. 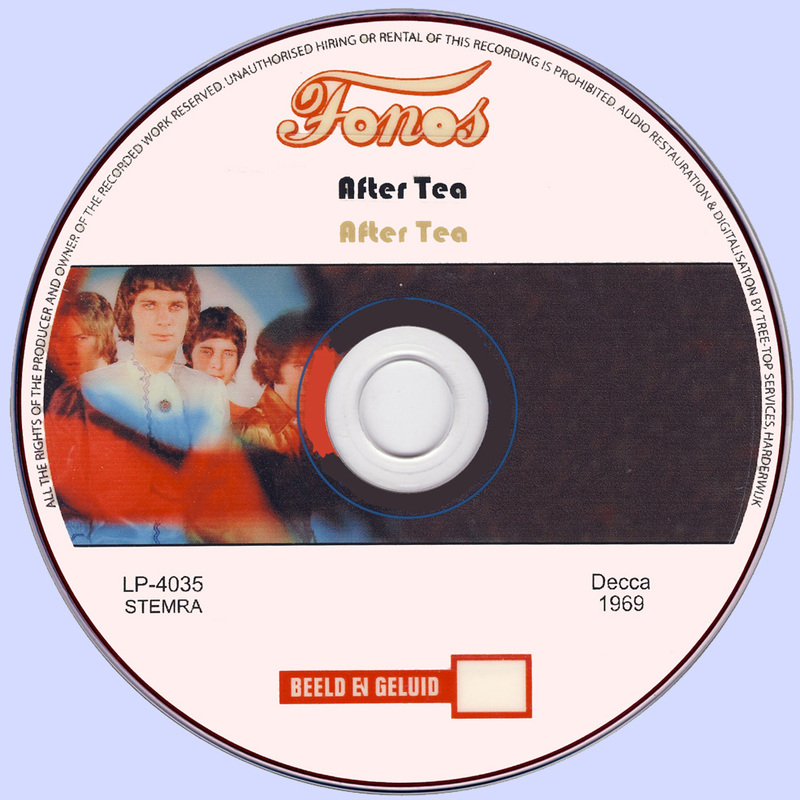 After Tea went through a period of many changes, Polle was in and out of the band and experimented briefly with Frans Krassenburg (vocals) and Henk Smitkamp (bass) and Ferry Lever (guitar) as a long term replacement for Ray. In May 1968 they released "Snowflakes On Amsterdam" and then in September, their fourth single"Peregrine Thomas" a country influenced song which didn't break into the Top 40. It's follow up "Love In Jeopardy" didn't make it either. Thanks to their loyal fans, they kept touring and at the end of the sixties they made a picture disc for the jewellers Desiree which was packaged with an engagement ring and book. The songs on the disc were "Desiree" and "The Wedding Song". The last single for Decca was "A Little Bit Today" in August 1969. Here they chose a standard R+B style. At the parting with Decca the album "After Tea" came out filled with a and b sides of previous singles.